Jtek AeroBrake Bar end shifter mounted braking system. Now you can have added braking control and safety right at your fingertips! The AeroBrake system is a brand new concept for bicycle brake control. Finally there’s a great solution for braking control while in your aerobar’s. Not only will riders benefit from the added safety aspect of always having brakes at your fingertips, you will also gain speed through smarter brake control and modulation. No more having to sit up each and every time you need your brakes. Now you can enter corners with greater confidence knowing that you can precisely regulate your speed while remaining in your tuck. The AeroBrake system will help you ride faster by reducing over-braking tendencies and allow you to stay in a more aerodynamically efficient position for greater periods of time. Great for team time trials and holding tight drafting positions. Ideal for triathlons where position control is critical to avoid drafting situations. Huge benefits for racing technical courses and more efficient corner braking. 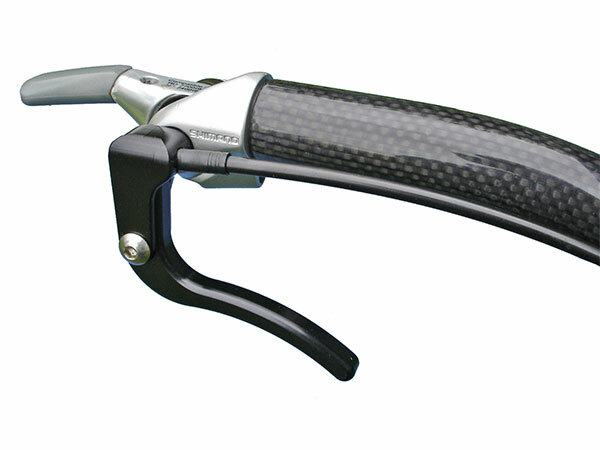 Super lightweight levers are only 28grams each, far lighter than any brake lever currently sold.